In the spring of 2017, Puerta Roja presented the ground-breaking exhibition Carlos Cruz-Diez: Mastering Colour. In 2018, we present once more the works by the Franco-Venezuelan master in a joint exhibition with the iconic Galerie Denise René. The exhibition titled Movement (2018) provides historical context through the works of the artist’s contemporaries whose careers, alongside Cruz-Diez, were catapulted by Denise René in the 1950s. Historical and recent works by Jesús Rafael Soto, Victor Vasarely and Yaacov Agam, are accompanied by younger artists’ works, furthering the legacy of the Op and Kinetic Art movement into the twenty-first century and giving both tribute and future life to the visionary spirit of Denise René and her artists. With the title of the exhibition, Puerta Roja not only captures the spirit of the historic movement, but also pays homage to both the trailblazer gallery and the beginning of Cruz-Diez’s career. Denise René opened her Parisian gallery in 1944 with Victor Vasarely’s first solo show and the vision to spearhead exhibitions focused on abstraction and, when critics and curators shun them, support the career of many artists that would become some of the most influential of the century.After the horrors of the war, many artists were fuelled by idealist notions of progress and, inspired by science and mathematics, they looked to change the world through reason and order. European and Latin American artists – who had been working on these ideas uninterrupted by the war – would move to Paris to work alongside each other. Using optical illusions and geometric patterns, the effect to both confuse and stimulate the eye was produced. The incorporation of the viewer’s interaction and the straightforward unpretentious representations, made the art inclusive, a common language of optimism that could reach all. Whilst at first sight the works may seem void of political undertones, these artists had a powerful social agenda, seeking ultimately to democratize the art experience. Vasarely, Soto, Agam and Cruz-Diez all strove to create a new shared vision of art that better reflected the times. Denise and the artists would ascertain their place in modern art history books with the ground-breaking exhibition Le Mouvement in 1955. A powerful champion for geometric abstraction and kinetic art, she envisioned putting the spotlight on her young artists by showcasing them alongside established ones such as Alexander Calder and Marcel Duchamp. It was at Le Mouvement that Carlos Cruz-Diez was introduced to the gallery and other artists by his fellow Venezuelan Jesús Rafael Soto. Ten years later both artists would participate in the historical MoMA exhibition The Responsive Eye, where the term ‘Op and Kinetic Art’ was first formally recognised. The eye-catching, imaginative and vertigo-inducing works swept the art world and enamoured viewers. Works appeared on the walls of major museums and galleries around the world and heavily influenced architecture, design and fashion. 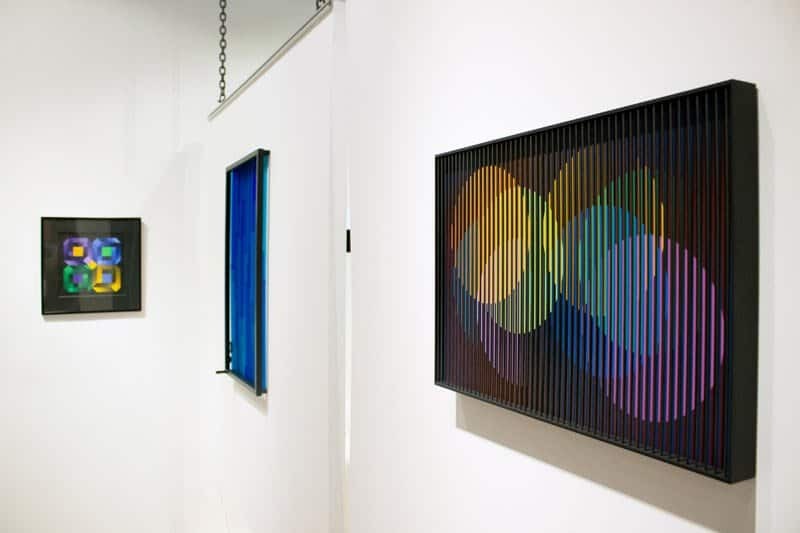 Cruz-Diez and Soto are prominently featured in the Puerta Roja Movement exhibition: Cruz-Diez’s Physicromie series (1959) and Chromointerference Spatiale Décembre (1964) use contrast and harmonisation to generate virtual colours that change depending upon the viewers point of perception. Soto’s El Ovalo Escarlata (2002) features his iconic linear, kinetic constructions with suspended metal rods in front of detailed patterns on wooden reliefs. The finely balanced, perpetually moving rods create ‘vibrations’ that extend into the surrounding space, connecting to the environment and breaking free from the fixities of traditional painting. Following a few years where conceptual art took over the spotlight, it was the strength of the philosophical ideals at the heart of the artists’ intent that would ensure the movement’s lasting legacy and current revival. A myriad of retrospectives on the artists, the movement and the gallery itself have taken place in the last twenty years. In 2001, the French National Museum of Modern Art paid tribute with the exhibition The Intrepid Denise René, a Gallery in the Adventure of Abstract Art, at the Centre Pompidou. The Pompidou would also reinstall its collection along the lines of art theory, including a dedicated section to Op and Kinetic Art. The Tate Modern opened A View from Zagreb: Op and Kinetic Art in 2016, a permanent room in its new building which includes works by Cruz-Diez, Soto and Vasarely. In the same year, The Illusive Eye reopened at El Museo del Barrio in New York with a celebration of the original MoMA show. These exhibitions attest to the enormous influence of these artists and open the door to re-evaluate the relevance of the movement to contemporary society. Today Op and Kinetic Art continues to develop with the next generation of artists. With strong roots in South America, the tradition is brought forward by new dynamic artists such as Argentinians Mariano Ferrante, Gladys Nistor and artist collective Ventoso represented by Puerta Roja in Asia. The contemporary furtherance of the movement also travels across borders, with French artist Oliver Ratsi, Dutch Hans Kooi, Swiss Pe Lang and Italian collective Gruppo MID – all having exhibited at Galerie Denise René – employ innovative materials and technology as well as contemporary advancements in computer sciences. An icon in the art world for her innovative spirit and distinctive programme, Denise René always said that art must invent new paths to exist. With this exhibition, Puerta Roja, entering its eighth year in Hong Kong, continues to open new routes and break boundaries for Op and Kinetic Art, particularly for Asian audiences. As it has been a regular feature in our programme, the exhibition introduces emerging talent alongside the great masters, presenting masterpieces and artists previously unseen in the region. I am grateful to Carlos Cruz-Diez and Carlos Cruz-Diez Jr. for first nurturing the idea of a collaboration between the two galleries. It has been an enriching experience to work with Denis Killian, under whose leadership, Galerie Denise René continues to support new contemporary production inscribed by the movements’ historical reference. By bringing together both of our stable of artists, we hope to highlight the connection between legacy and new proposals through the deeply universal ideals of the movement. I believe, the essence and profound undercurrent of optimism and democratisation of art is more important than ever. Amidst our present troubled era, experimenting with illusion is not a sign of denial but one of hope for the future, an optimistic stand of resistance against an increasingly unstable socio-political world.